In 12-inch nonstick skillet, heat oil over medium-high heat until hot. Add chicken; sprinkle with salt, 1/2 teaspoon of the thyme and the pepper. Cook 5 minutes or until chicken is browned, stirring frequently. Move chicken to one side of skillet. Add carrots and potatoes; cook 5 minutes, stirring frequently. Add gravy to chicken and vegetables; mix well. Heat to boiling. 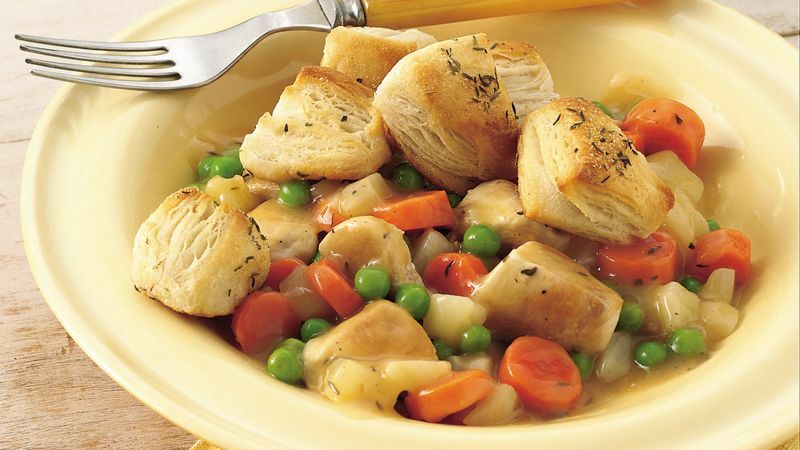 Reduce heat to low; cover and simmer 20 to 25 minutes or until chicken is no longer pink in center and vegetables are tender, stirring occasionally and adding peas during last 5 minutes of cooking time. During last 15 minutes of cooking, heat oven to 400°F. Separate dough into 10 biscuits. Cut each into quarters; place in large bowl. Add garlic powder and remaining teaspoon thyme; toss to coat. Place on ungreased cookie sheet. Bake 8 to 10 minutes or until biscuit pieces are golden brown. Scatter over top of cooked chicken mixture before serving. You can purchase the gravy for this recipe in either 12- or 15-ounce jars.